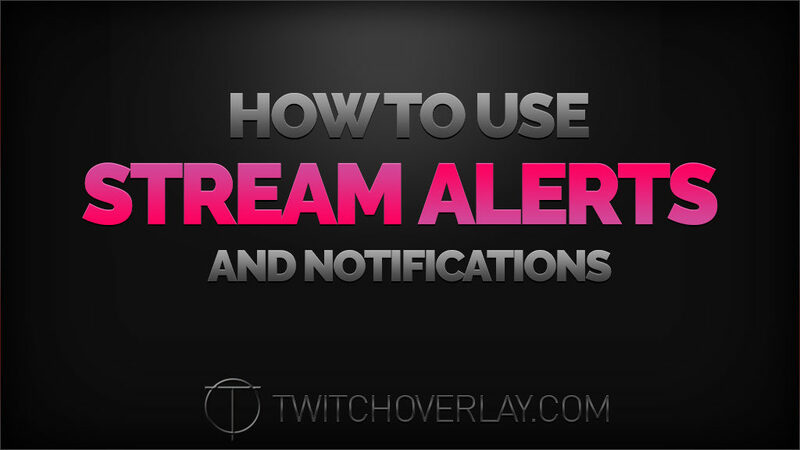 There’ve been an increasing number of people asking how to use stream alerts & notifications recently, so I thought I’d write this quick article for the future reference of anyone with similar questions or uncertainties on the role of Twitch Overlay in that process, and what other steps are involved to get personalised alerts for things like new followers, people hosting, and donation pop-ups. Firstly, and this is an important point, Twitch Overlay do not provide an alerts service. Buying alerts from Twitch Overlay will not enable an alerts service on your account, or provide you with software to do so. This is a site to buy and download graphics that suit that purpose, but you will need to apply those graphics to a service that specialises in showing alerts on your live stream. Think of it like OBS or xSplit, if you buy an overlay from here, you will need one of those programs to use the overlay with. Buying an overlay from T-O wouldn’t just make the overlay appear on your stream, and you’ll need to apply yourself. Alerts are (more or less) the same. Now, let’s say you’ve just bought a pack of stream alerts from Twitch Overlay, what do you do to now get those bad boys on your stream? Well, there are options. My top two recommendations are always either the NightDev suite of alerts, or the ever-popular StreamLabs (formerly “Twitch Alerts”). NightDev tools have been around since the dawn of streaming. They’re tried and tested alerts, that just work. Simple alerts that you can get working with little effort, but that you can also DIY to go further, if you have the know how. There’s no control panel or central place for you to tweak and deliberate over, these are very much “set and forget” kinda alerts. Because of the ease of use of NightDev, and the fact it’s a step-by-step process, you don’t really need me to guide you through this one. StreamLabs is a behemoth, used by practically everyone. And with good reason, really. They offer a central location, where you can edit the look of each alert without really leaving the page. Getting your alerts up on StreamLabs is also pretty straight forward, and only requires a few tweaks beyond the default settings. Here’s a screenshot of the settings I’ve used to get one of the Razor Alerts graphics set-up in StreamLabs. That should hopefully set you on your way. As always, if you have any further questions, please feel free to use the contact form and I’ll try to get back to you as soon as possible.